When we first moved into our home, we designated the downstairs "bedroom" to be my office and studio. 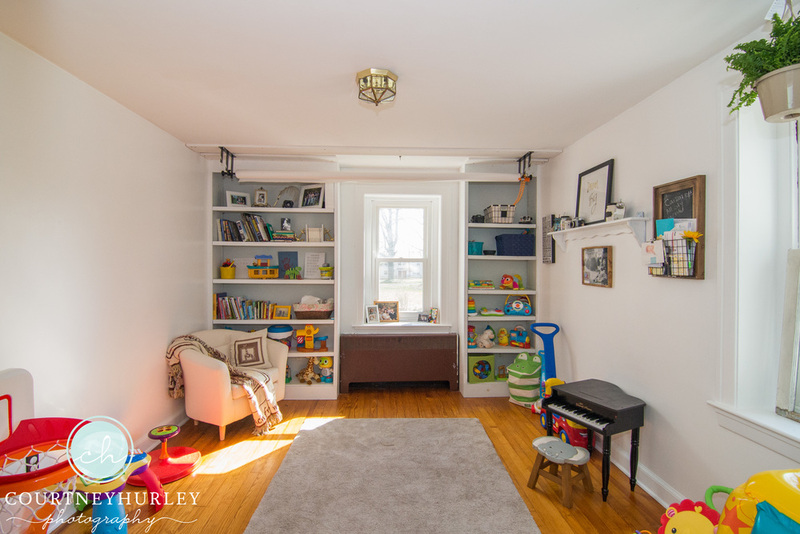 However, it quickly became known as the "catch all room" Needless to say, I became insanely overwhelmed every time that I looked into this once adorable room and was desperate for a solution. Something needed to happen, and it was time to take action. I called Laura, owner of Laura Earnst Interiors, to come and help me brainstorm. We decided that this room could only be used to it's fullest potential when used as a multi purpose space. It's not quite what I had in mind when I first fell in love with our home, but I am loving the new plan. I no longer have to clean up the family room every night because the built in shelves now hold all of our little man's toys and we mounted my studio backdrop on the ceiling. This is a huge space saving feature on the studio side and it's a bonus because when I have clients in the studio the backdrops hide all of the toys! Win win! Along with everything in our house, there are still several unfinished projects in this room, but with that being said, we are finally off to a great start! What rooms do you have in your house that overwhelm you? Are there any spaces that you can combine to be multi purpose? I would love to hear your design dilemmas!